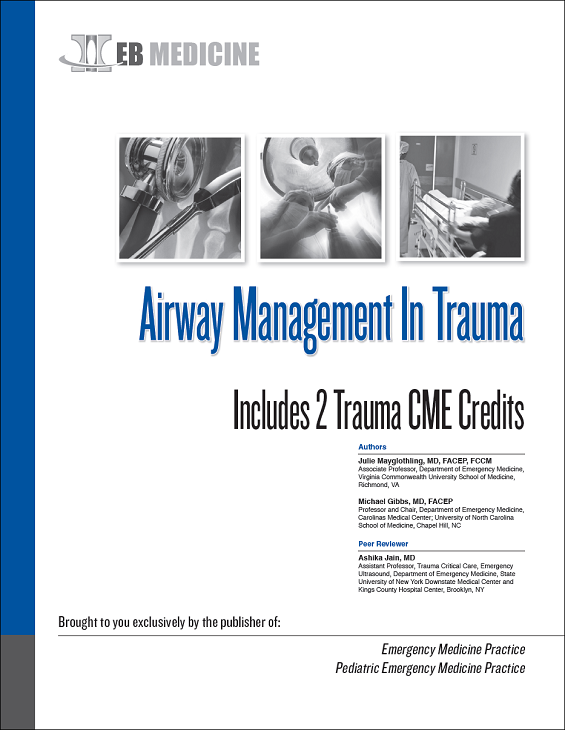 This resource reviews aspects of emergency care for airway management in trauma: methods to avoid hypotension during intubation, the advantages and disadvantages of direct laryngoscopy versus video laryngoscopy, choice of agents for induction in rapid sequence intubation, and situations in which cricoid pressure, rescue devices, and cricothyroidectomy should be utilized. In addition to our distinguished authors' discussions, we have included pertinent commentaries on each topic from the perspective of emergency medical services, the research perspective, and the surgical perspective, in an effort to give a view of all aspects of airway management. To purchase the full version of the Emergency Trauma Care: Current Topics And Controversies, Volume I click here.